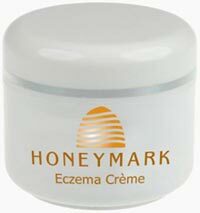 Honeymark's Eczema Creme is a maximum strength cream that when applied to affected areas of the skin helps relieve symptoms associated with Eczema, minor skin irritations, itching and rashes. Additional uses of this cream can be for Seborrheic Dermatitis, Poison Ivy, Poison Oak, Poison Sumac, Psoriasis and insect bites. Apply a generous amount of Honeymark's Eczema Creme to affected areas 3-4 times daily to help control itching and reduce the formation of scaling on the skin. Apply to clean skin and reapply after washing. We recommend using fragrance free or hypoallergenic cleansers. A vegetable-derived, nonionic self-emulsifying & stabilizing agent. A cyclic dimethyl polysiloxane. Skin conditioning agent and emollient. Confers an incredibly soft, silky feel to the skin, evaporates quickly leaving little residue on the skin. A hormone produced by the adrenal glands. Vitamin C, derived from citrus fruit. It is used commonly in hair and skincare products and many post perm ingredients to neutralize odor. Has astringent and antioxidant properties and also can be used as a stabilizer and preservative.